I’ve been registering voters in Texas for years now and I’ve worked hard to explain to voters the challenges of the very strict voter ID laws we have endured here for the past several election cycles. The IDs that they already have, IDs that work in almost every other situation were not allowed as Texas voter IDs. Citizens who didn’t have a copy of their birth certificate for some reason or another were in a bind trying to get the proper documents. People who live on a shoestring couldn’t afford even the fairly small fee to apply for the approved ID. Quite a few told me they didn’t have transportation or they couldn’t afford to take off work and stand in line at the DPS office. So you can imagine how pleased and relieved I was when the U.S. 5th Circuit Court of Appeals affirmed earlier court rulings that the 2011 Texas voter ID law does not comply with the Voting Rights Act. Here in my community, we are gearing up for our get out the vote effort and I’m hopeful this shift will encourage more people to take advantage of our right and privilege to vote. I hope with these obstacles removed, more people will step up to our sacred obligation to participate in our democracy. This is an interesting campaign tactic. Of course he is tapping into a long Republican history claiming voter fraud is a significant problem and legislating against this perceived problem. Despite his claims and Republican paranoia, voter fraud is not a significant problem in the United States. In fact, voter fraud is rare. A 2014 study by Justin Levitt, a professor at Loyola Law School, found just 31 possible instances of fraud over 14 years of elections with a total of 1 billion votes cast. 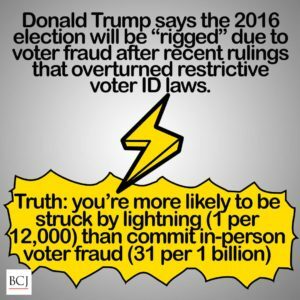 This study concluded that a person is more likely to be struck by lightening than to commit in-person voter fraud. 1 in 12,000 vs. 31 in 1 billion. I count mail-in ballots in my little East Texas community and I have to say I’m impressed with the process. From Red to Blue to Purple, from the County Clerk’s office to the local chairs of each party, we work together to make sure every vote counts. Each of us has our own passion about any given election, but I believe most people who step up to do this work, do it with deep integrity. As with so many other claims Donald Trump makes, his spurious assertions about rampant voter fraud are designed to stir fears and incite alarm. Let’s resist this paranoia and work together to ensure every fellow citizen has an opportunity to vote. This nation will only become stronger and smarter when every voice is heard. See the full Washington Post article here. Charlotte, since you help people to register in Texas, (we are residents of South Dakota) just how hard is it to register and vote in Texas? (Serious question). In SD, I went to the courthouse, filled out paperwork with my name and address, signed the form certifying, under penalty of law, that the information was accurate, showed my drivers license and I was registered. Since I do volunteer work out of state, I vote by absentee ballot. I fill out the absentee form and a photocopy of my license and mail it back. Not hard at all. Is the process in Texas so restrictive that people are prevented from voting? Please explain the process and the laws that are making it so difficult for citizens to vote in Texas. The process in Texas is similar to your own. People fill out the registration card, write down their drivers license number or their SS number, affirm that they are TX citizens and live in the county, and turn it in. The Registrar confirms the information before they are registered and receive their voter card. The recent dilemma has been when they show up at the polls to vote. Is this person who they say they are? Is this the person who is actually registered? There are numerous appropriate ways for people to show ID to confirm their identity and residence. Now with the overly strict laws out of the way, people can use the ID they use at the food pantry or the WIC office or the health department. Many people do not drive and do not have a drivers license. College students have drivers licenses from out of state but their photo college ID was not a valid voter ID. There are many people and many different situations out there. You and I are fortunate that our lives are so easy in this matter. The link to Mr. Levitt’s study, “The Truth about Voter Frau,” is in my article. It’s a 50 page pdf file that I downloaded. Check out the Brennan Center for Justice. 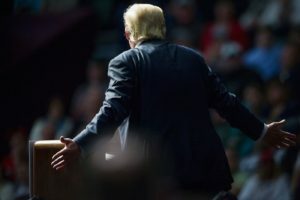 https://www.brennancenter.org/issues/voter-fraud Thanks for reading and thanks for the conversation James. After reading Mr. Levitt’s own references, I find his number of 31 wrong. He showed over 150 in one reference alone. Just like other crimes, only a small percentage are reported, prosecuted, and convicted. Since he listed several references, I don’t know how many fraud cases were duplicates. The important thing is that there is fraud. Question: How would you ensure that people who can not legally vote are kept out, while protecting the voting rights of legal registered voters. Birth certificate, drivers license, state issued picture ID, student ID, are good legal IDs that anyone can get. Are these acceptable, and can you name any other forms of ID? I am a 68 yo retired businessman, not wealthy, but comfortable, doing volunteer work for the last 10 years. I have or have had acquired all of the above IDs with no problems. I understand how a disadvantaged person may not have access to every form of ID, but they have free easy access to some form of picture ID. The current issue is that Republican legislators are using the voter fraud myth as a scare tactic to tighten up ID requirements and make it harder for minority citizens to get the approved ID. It’s a targeted calculated move that the Courts are overturning. This from a recent Texas Tribune article: “A study done by News21, an investigative journalism project at Arizona State University, looked at open records from Texas and other states for the years 2000-2011 and found 104 cases of voter fraud had been alleged in Texas over that decade. Thanks for the conversation Jim. Thanks for caring. The Texas Tribune article cited 104 cases of fraud in Texas alone. Mr. Levitt’s found only 31 cases nationwide. I will have to throw out his whole article and chalk it up as political partisanship. You always seem to accuse “Republican” legislators of attempting to prevent minorities from voting. Maybe it is Democrats who are attempting to sway elections with voter fraud. Remember ACORN in 2008. How about the Virginia governor ignoring the Va. law by giving mass voting rights to felons. The courts overturned him, so now he is legally giving the vote to each felon individually. Charlotte, I respect you, but your argument would carry more weight if you would leave the politics out. Both dems and repubs try to use the system to keep their power. Is there voter fruad? YES. Is there massive voter fraud? Define massive. Is there enough fraud to sway an election? I HOPE NOT! Jim you can google “voter fraud statistics” as easily as I can and look at the numerous studies that are out there. Voter fraud used to be a big problem in this country; there are plenty of legendary stories about corrupt politicians getting elected by dead people. But that is not the case today. There still are risks of election fraud by parties and special interests but the evidence continues to support the facts that individual voter fraud is a non-issue in the outcome of elections. You need to show ID to check out a library book, why should you not have to prove that you can legally vote? Without proper ID, people can vote numerous times, using fake names, non citizens could vote. I think every American of legal age has the obligation to vote, but we must stop voter fraud. Democrats have a history of massive voter fraud and Republicans have a history of voter suppression. We must have FAIR elections. No one is advocating for no ID James; all we’re asking for is a fair process. Recent Court rulings say that the strict ID demands are unnecessary and create an undue burden. Much of this legislation intended to suppress the minority vote. This is the problem I am addressing here. Thanks for writing. Sorry Charlotte, but some people are advocating no ID. Some dishonest people do want to commit voter fraud. Just like people commit other crimes, for their own enrichment. How do you know that legislation is intended to suppress the minority vote. You may sincerely feel that is the intent, but if they don’t say it, how do you know. As a woman of God, you know you can not look into someone’s heart and judge their intent. Only God can do that. And they will be judged by Him. I want a fair process too. I do not want an illegal vote, cancelling out any bodies legal vote, whether it be voter fraud or legislation. Thank again for the open and civil discussions. If a person can take off to vote, is it not possible for them to take off or find time to get an ID? Most of us have to prove who we are to get drivers license, enter a hospital, get s.s., unemployment, welfare, get credit cards, and the list goes on! If it is important enough for us to vote, it seems it might be important enough to manage to come up with an ID. Good point Tommie. You bring up another problem that folds in to the whole issue of voter suppression. Early voting, Saturday voting and vote by mail are some of the ways people can work around their schedules and get to the polls. Court rulings are striking down laws that limit these options so that more people can vote. Thanks for writing. Thank you, Ms. Coyle, for addressing this. I will be sharing it.